We got new dining chairs! We had our last beige eiffel chairs (I put a picture near the bottom of the post for you!) for three years and still loved them for how easy they are to wipe down, but were itching for a change. Over Thanksgiving, we hosted 30 Marcums and had to pull out all of the chairs under our roof. Among them, was one of these low back Windsor-style chairs that I used as an office chair for some time. I forgot how comfortable it was! And it looked so good with our dining table. It sparked an idea, and on Black Friday, I noticed they were on closeout on Wayfair (still are!!) and I snatched up 7 more. It was nice to order a chair that we had lived with for so long and knew we liked. These chairs are available at Overstock ($140) and Wayfair (closeout sale for $84!!). Update! For sale on Amazon here. 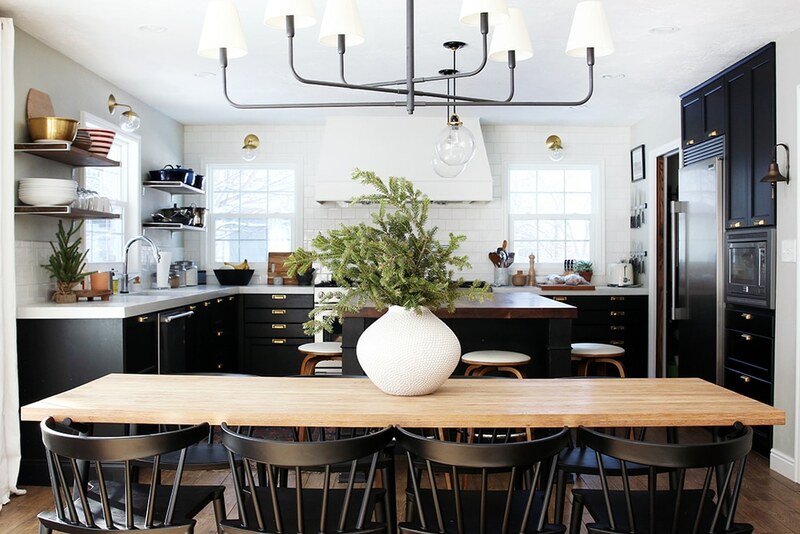 On Houzz here. They are molded plastic and all one piece, which means they don’t knick like black wood does (our taller back windsor chairs had light scratches all over the seat!) and aren’t going to come loose at any joints. 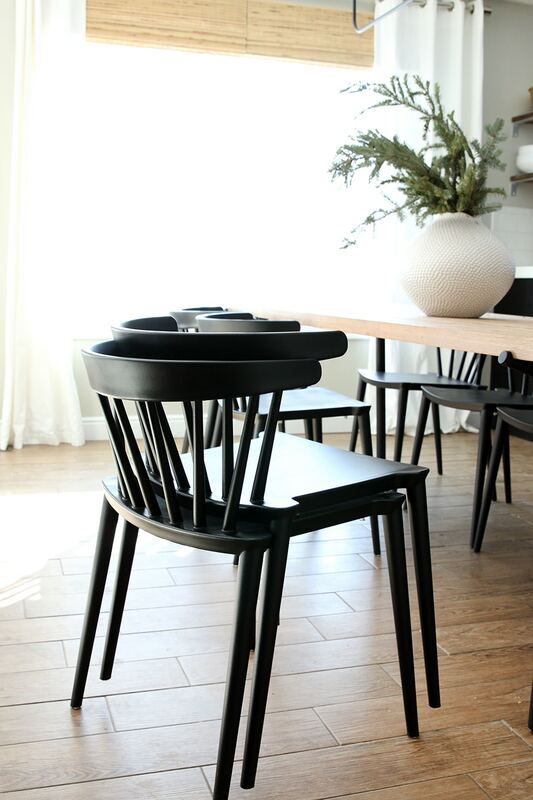 I love the modern lower curved backs that are really supportive, the slightly tapered legs, that we can fit 8 easily at our table and they can stack when we don’t want that many! I think both are really good options, but I’m loving the sophistication of the black ones now and the contrast they bring. 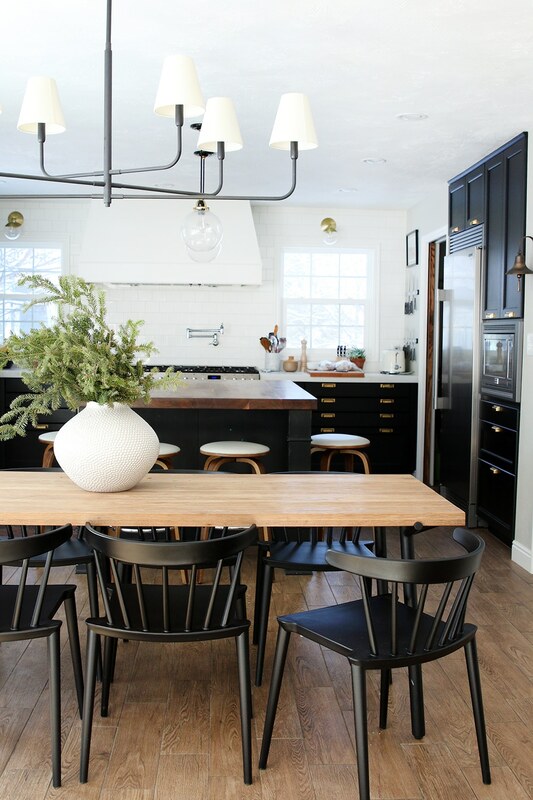 For a long time, I worried that black chairs would blend into our kitchen cabinets, but in reality, they make the dining table more distinct and the whole set-up feel less cluttered. We’re brining the old shell chairs up to the cabin for now, so we don’t have to sit on patio chairs while we’re there (haha), but if you’re interested in those, they are still available here (on Amazon) or here (on Target) or here (on Overstock). 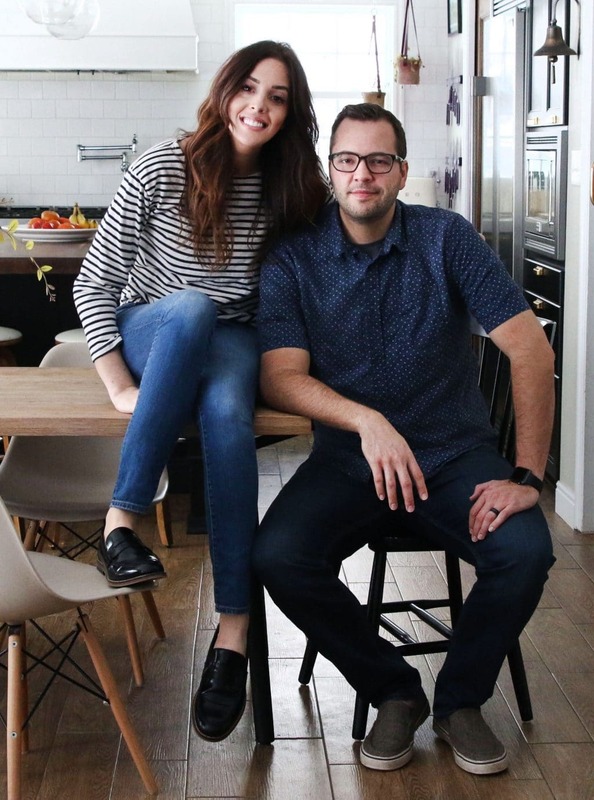 « Ep 51: Holiday Traditions, Bathroom Reno in a Week & We Have Water Damage! Gorgeous space! Please can you give me the room dimensions of the kitchen and the island and the distance to the dining room table as well? 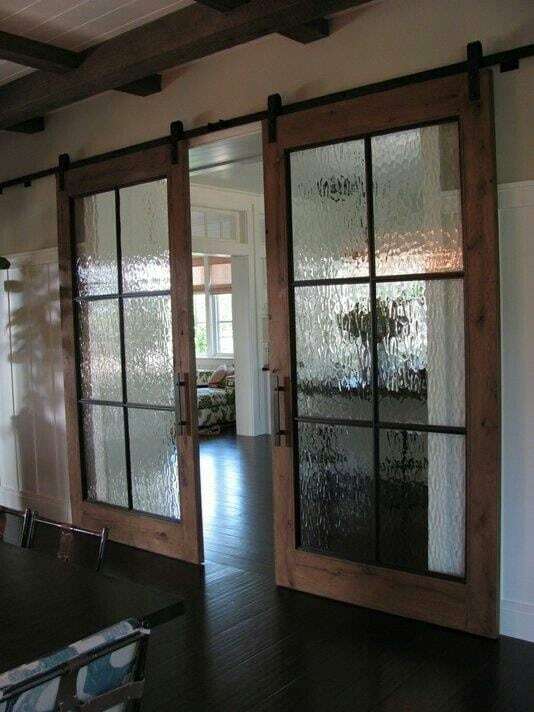 We’re starting a renovation shortly and I’m trying to see if we can do something similar! 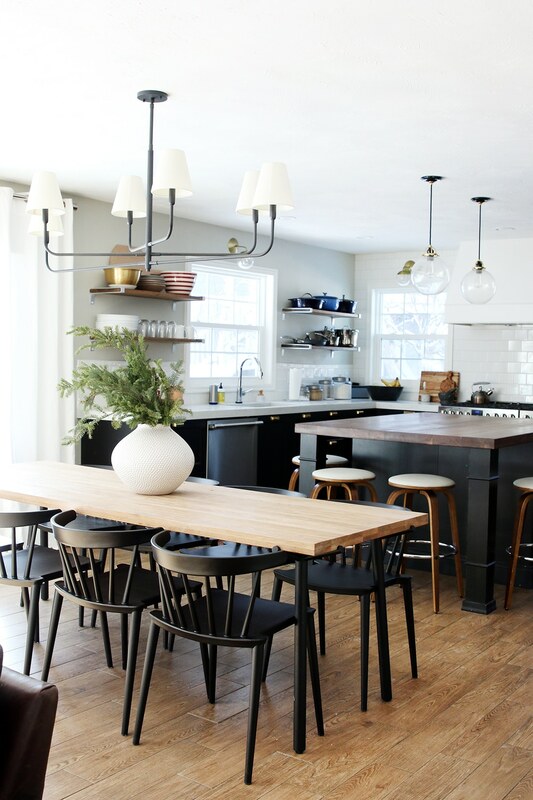 Where is your light fixture over your table from? I love it! It’s actually a discontinued fixture, but Jules wrote about some look-alikes today! You can see them here. It’s by Kwal paint, it’s called Crave. Very nice, much less busy. Love the change. Great suggestion !!!! 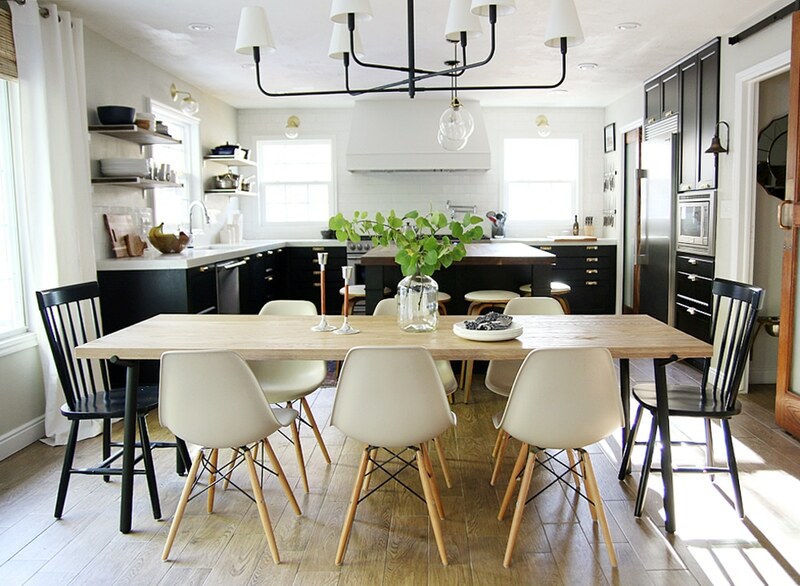 I love this table and dining chair !!!!! Love the blackchairs and that they’re plastic! We have white Panton S chair knockoffs at our black dining table which are also plastic. 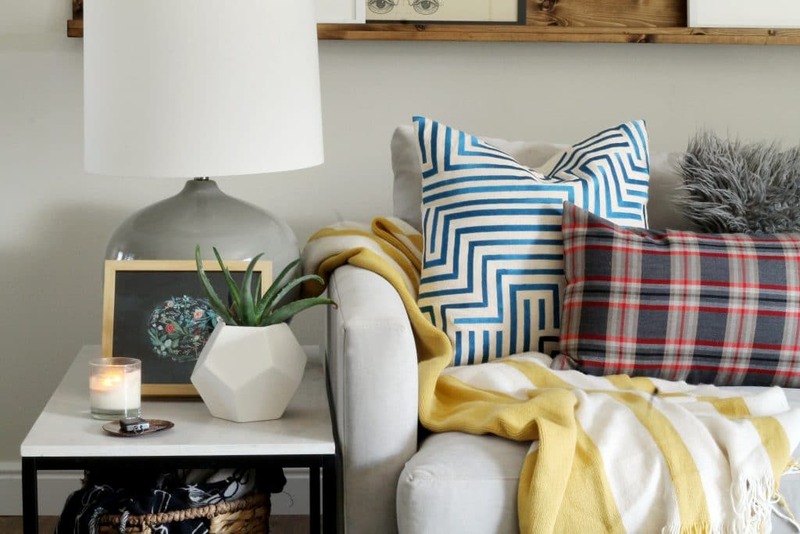 After living with white West Elm scoop chairs and benches, it is awesome to have something that wipes down and doesn’t show any wear or tear. 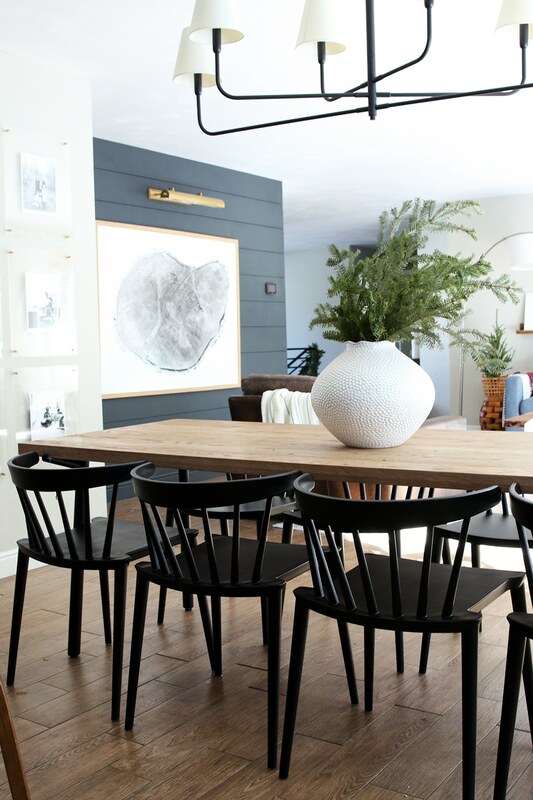 We got our S chairs from Poly + Bark – they also have gorgeous black ones which might look amazing at the heads of your table. I love, Love, love this!!! Your table is a dream, but the price is not 🙁. Have you ever found a cheaper knock off 🤔? The chairs I can do!!! Whoa, had no idea these were plastic! I have a question about that, and mostly about the plastic shell chairs too (since I’m considering something similar). Do you find that the plastic is staticky? I think that’s my only holdup! (We have upholstered chairs now, and ya, not going to keep them for long with kids!). Hmm, good question. We haven’t noticed anything static-y at all. And yes, our last chairs were molded plastic too. They are just our absolute favorite choice with little ones. These are so convincing, too. These look great. They help showcase the table and create a calm look. Love them! Good choice, they do look a lot nicer than the previous… though I did not think previous looked poor. Sharing both, for sure the black! Do they look plastic-y?? Really love them and am thinking about getting them in white. I just don’t want them to scream “I’m plastic!”. lol. Love that you can wipe them down with kids!! I don’t think they look obviously plastic at all. yes!! Thank you! And thank you for your amazing find! Cheryl – Did you end up buying the white chairs? I’m curious about the “plastic-y” look of the white ones. 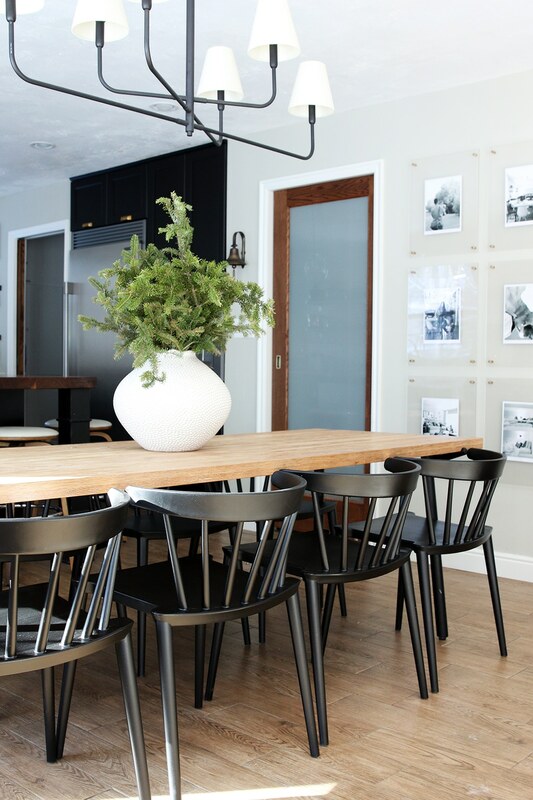 We host dinners here all the time, but I will say, we went narrow on purpose–to better fit the allotted dining area so it wouldn’t feel as cramped. 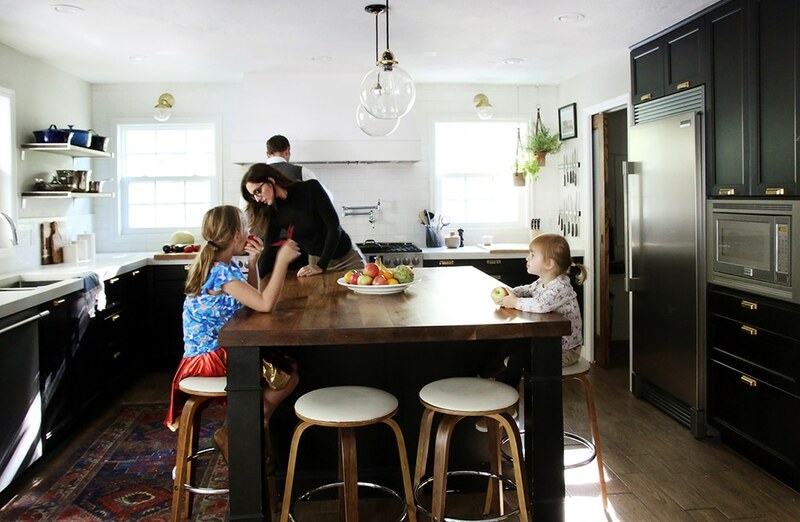 We love this table because it is stylish AND narrow, something we needed. We can fit plates and food at the table, but it’s not unusual for us to dish up at the island when we have a lot of people over. It’s virtually indestructible as far as kids go. But some of the grain lines are deep and I take something like a bottle brush to it if things get down in the cracks occasionally. Thank you so much for the quick reply! I may just have to make this table a little Christmas gift for myself. ;) Your home is beautiful! Loving those back chairs!! This reminds me, i need to take a magic eraser to our white shell chairs ASAP! Do they look like plastic in person? They look like wood in your pictures. They look very convincing even in person. Are they really sturdy? Tippy? 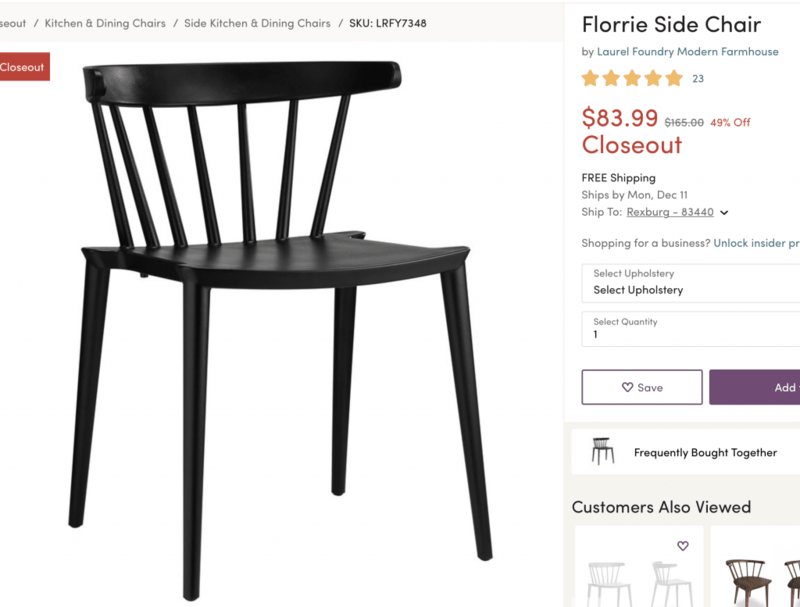 I bought similar spindle black chairs with a higher back that a wood (same or very similar to the end chairs you had previously) and they seem to tip easily with my kids, these seem like they may be a better option?? These are really solid and have a nice, wide base. Our shell chairs tipped a couple times (mostly when our 7 year old would rock forward–go figure!) but these seem really grounded. Love the change! Completely agree with Melissa that the sightline is much prettier and visually cleaner. Wow these really make the entire table and sightline much prettier!